"What, Bethany?" you ask. "Have you surrendered your principles?" No, it's not what you think. Read on. A few years ago, I dated this guy who was the worst. He was the type of guy who would be all, "Let's do something Friday!" and then Friday would roll around and he would suddenly cancel with some weird explanation about him just being too afraid to love and be loved. And then a week would go by, and he would call me out of the blue and apologize and insist on doing something spontaneous and romantic immediately. In retrospect, I'm not even sure we were dating as much as playing some weird, real-life version of Whack-a-Mole. But this guy did love one thing, and that thing was this script he was working on. "Working on my script" was his excuse for everything. Me: We had plans last night. Where were you? Him: Oh, sorry. I was working on my script and fell asleep. Me: Did you still want to see that movie on Friday? Him: I have to cancel. I need to work on my script. Me: Someone used up all the toothpaste. Him: What? I can't hear you talking over my script. As our [Whack-a-Mole] relationship began to deteriorate, I slowly came to loathe that script. And he became more and more insane. Me: How's the script going? Him: Fine. I'm making great progress. Him: You mentioned my script? To people? HOW DARE YOU? You are forbidden to speak of the script to anyone. Now, if you'll excuse me, I need to go fashion a new foil helmet for myself and drink all of the jars of urine in my refrigerator. When things finally ended, I was unsurprised but in a lot of pain. I was already in therapy at the time, having escaped an emotional abuser the year before. I was a bit like one of those broken eggshells you can't see until you try to take it out of the carton and it goes everywhere and ruins your breakfast. It honestly wasn't going to take much to send me back down into a spiral of pain. So, even though the relationship was short, my pain was not. But there was one thing that gave me comfort during the months afterward, and that thing is Seth MacFarlane. This guy I dated went to school with Seth MacFarlane. And after they graduated, Seth became wildly successful, and this guy did not, no matter how hard he typed away on that god-forsaken, never-ending script. He had even sent him his resume being like, "Hey, remember me?" and got no response. It was kind of a bitter sticking point for him. But after things went south with our horrible relationship, I used to post passive-aggressive Family Guy clips on my Facebook. At least until he finally unfriended me. And then I got over it and moved on. 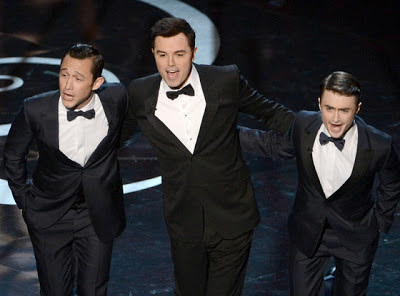 So, as sexist and racist and every other word ending in -cist you can think of Seth MacFarlane was on the Academy Awards last night, he has provided me some of the best, most therapeutic chuckles of my life. He will always have a special place in my heart. Which is luckily not where I keep my principles. Those are in my sock drawer.